THOUSANDS of people in north Pembrokeshire, Carmarthenshire, and Ceredigion could be without water for the rest of the day after a water main burst. A rupture in a high-pressure main at the Llechryd Water Treatment Works is responsible for the problem, according to Welsh Water. It appears that Crymych is among the worst-affected areas. A Welsh Water spokesman said: “This main runs from Llechryd water treatment works and helps us provide drinking water to many communities across parts of Cardiganshire and parts of Pembrokeshire. 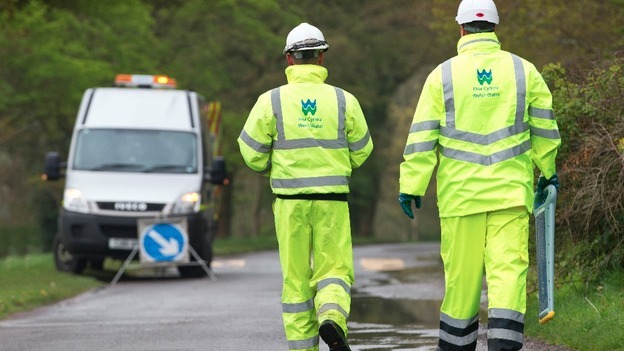 The latest statement from Welsh Water says: “We are working on repairing a burst main on an important water main near Pontrhydyceirt in West Wales. This main runs from Llechryd water treatment works and provides drinking water to many communities across parts of Pembrokeshire. The communities affected are Crymych, Boncath, St Dogmaels, Tegryn, Moelgrove and Nevern. Welsh Water have said that those customers with additional needs or families with young babies who are affected by this interruption are also being supplied with bottled water . Any requests can be made on 0800 052 0130. From Welsh Water: “We have been working overnight to repair the burst on the water main near Pontrhydyceirt in West Wales. This main runs from Llechryd water treatment works and provides drinking water to many communities across parts of Pembrokeshire. The communities affected are Crymych, Boncath, St Dogmaels, Tegryn, Moelgrove and Nevern. “The repair has been completed and we are working to restore supplies to these communities over the morning. While we continue to get supplies back to normal, we are distributing bottled water at Crymych Water rugby club station, SA41 3RQ, The Salutation Pub in Felindre, SA41 3UY and the car park opposite Penybryn Arms, SA43 3NJ, for those customers still affect. We are also tankering water into key local network points. “We are really sorry for the ongoing inconvenience. OUR team has been working throughout the night and has completed the repair on the burst water main near Pontrhydyceirt in West Wales. We sincerely apologise to customers who are without water in Crymych, Boncath, St Dogmaels, Tegryn, Moelgrove and Nevern. We have begun refilling the local network. However, we need to do this carefully and at a steady speed as refilling too fast can damage the pipes and cause further bursts. Whilst water supplies will begin to go back to normal during the afternoon, it will take longer to fill the whole water network. This is not unusual in rural areas and water supplies should be restored by this evening. We are continuing to distribute bottled water at Crymych rugby club (SA41 3RQ), The Salutation Pub in Felindre (SA41 3UY), and the car park opposite the Penybryn Arms (SA43 3NJ), for those customers still affected. We are also tankering water into key parts of the network to maintain supplies. As supplies return to normal, this may result in discoloured water for a period of time. This is not unusual after an incident of this nature and should clear within a short period of time. We would like to assure customers we are working as quickly as possible to restore supplies to normal. We apologise again for the inconvenience that this burst has caused. If anyone has concerns about their water supply, we would ask they call our helpline on 0800 052 0130.